First of all, Daddy wants everyone to know that he is VERY impressed with Moose for figuring out what he was that weird night. Yes, mommy made him a Snow Blower. I dont know what that is, but daddy say's he was hurt by one when he was a little pup, so he will never forget it. Mommy says she was very creative and sneaky with the stuff she wrapped herself in. She said she was "Cautious". I dont know what that means, but she said the hoomans would. Now, back to the issue at hand. What the heck is this...? One day this week, mommy said she was going to go visit a friend. But then when she came home, this is what I smelled. Little fluffy's and big furries! What is up with that? She said she just had to go cuddle on another big doggie, since I dont cuddle much these days. So off she went to cheat on me. Now this picture looks like everyone was friendly and welcoming. Ummpphh, Im a little peeved here! But then the truth came out. 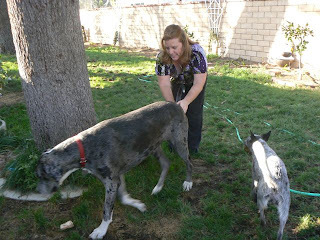 Mommy said that Mandy the Dane was really having NOTHING to do with her. She said she played hard to get, and would barely come within a fingers reach. Well, I know I am a LOT more fun than that. 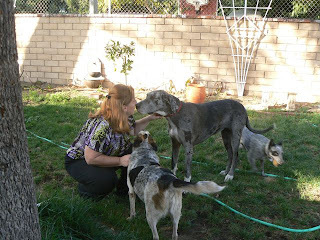 Mommy said she guessed that Mandy is very loyal to her own hoomans, and wasnt going to give my mommy the time of day. Mommy tried everything to coax her. Then I found the evidence of how bad mommy wanted attention. She even chased Mandy and tried to pull her tail. Poor mommy, she was pretty desperate. I dont understand, I thought I was all the girl she could handle. 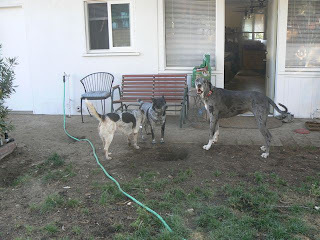 Here is a parting shot of Mandy, with her brother Buddy (the one that is the same color as her) and their friend Lakota. It looks like they are trying to decide who to blame this big hole on. Well, mommy, at least I would NEVER dig a hole like this, so you better consider yourself blessed with THIS PRINCESS!! BARK!! Sasha the Princess! Oh Sasha - definitely - your humans don't appreciate how good you are! Just see what happens when they think the grass is greener! Hah! Yay! I can't believe I guessed right! I love seeing creative things like your pawrents costumes but am always the last to figure them out! Those pups are very cute, but nothing compared to a princess like you! Your mom is a big cheater for sure. 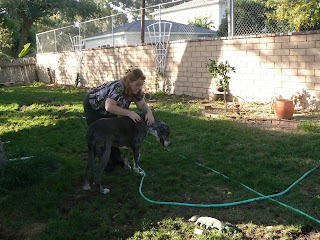 Even if you don't want to cuddle sometimes, that is no reason to go off stalking other danes. Sheesh! 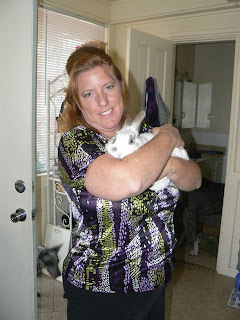 Aaaaawwww, that doggie does look like Max :) And what's w/the bunny, is it frenz w/the doggies??? Tell Sasha if she wants I can have Maizee come visit and give her a real good back massage....she's REALLY good at kneading over & over & over & over & over LOL! A snow blower! Clever! I was thinking a blizzard! Poor Sasha. You know she loves you more!